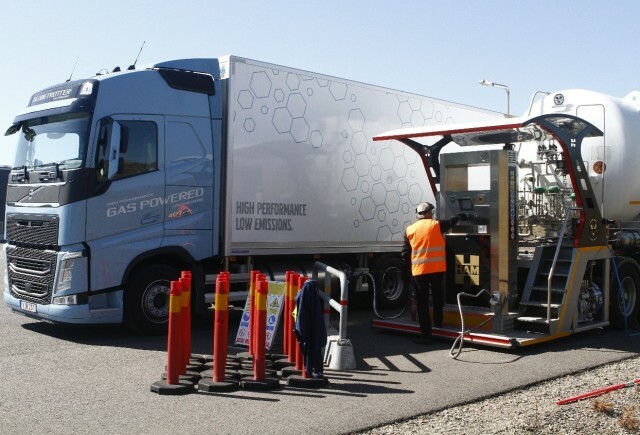 The HAM Group was selected by Volvo Trucks to provide an LNG mobile unit to refuel its Volvo Gas Power trucks during the last Test & Drive event that took place in Hellered (Sweden) in April and May, near the facilities of the Gothenburg truck manufacturer. HAM’s mobile unit has a capacity of 30 m3 and meets the requirements to refuel Volvo trucks. This operation was carried out by a single supply hose that alternates the LNG refueling with the depressurization of the generated boil-off. About 10 trucks were supplied per day following HAM’s philosophy, in an easy, practical and safe way for drivers. It should be noted that the HAM Group also supplied the LNG mobile unit during the Volvo Test & Drive held in Castellolí, Barcelona, during October and November 2017, which served to reinforce Volvo’s confidence in HAM’s natural gas supply operations. Currently, the HAM mobile station was moved to another point in Spain to continue supplying LNG and CNG. HAM is developing natural gas solutions for industrial vehicles since 2000, helping reduce CO2/NOx and particulate pollutants to protect the environment.